This article is about the Western Christian 40-day period. For Lent in Eastern Christianity, see Great Lent. For other uses, see Lent (disambiguation). Lent (Latin: Quadragesima, 'Fortieth') is a solemn religious observance in the Christian liturgical calendar that begins on Ash Wednesday and ends approximately six weeks later, before Easter Sunday. The purpose of Lent is the preparation of the believer for Easter through prayer, doing penance, mortifying the flesh, repentance of sins, almsgiving, and denial of ego. This event is observed in the Anglican, Eastern Orthodox, Lutheran, Methodist, Moravian, Oriental Orthodox, Reformed, and Roman Catholic Churches. Some Anabaptist and evangelical churches also observe the Lenten season. The last week of Lent is Holy Week, starting with Palm Sunday. Following the New Testament story, Jesus' crucifixion is commemorated on Good Friday, and at the beginning of the next week the joyful celebration of Easter Sunday recalls the Resurrection of Jesus Christ. In Lent, many Christians commit to fasting, as well as giving up certain luxuries in order to replicate the account of the sacrifice of Jesus Christ's journey into the desert for 40 days; this is known as one's Lenten sacrifice. Many Christians also add a Lenten spiritual discipline, such as reading a daily devotional or praying through a Lenten calendar, to draw themselves near to God. The Stations of the Cross, a devotional commemoration of Christ's carrying the Cross and of his execution, are often observed. Many Roman Catholic and some Protestant churches remove flowers from their altars, while crucifixes, religious statues, and other elaborate religious symbols are often veiled in violet fabrics in solemn observance of the event. Throughout Christendom, some adherents mark the season with the traditional abstention from the consumption of meat, most notably among Lutherans, Roman Catholics and Anglicans. Lent is traditionally described as lasting for 40 days, in commemoration of the 40 days Jesus spent fasting in the desert, according to the Gospels of Matthew, Mark and Luke, before beginning his public ministry, during which he endured temptation by Satan. Depending on the Christian denomination and local custom, Lent ends either on the evening of Maundy Thursday, or at sundown on Holy Saturday, when the Easter Vigil is celebrated. Regardless, Lenten practices are properly maintained until the evening of Holy Saturday. The English word Lent is a shortened form of the Old English word lencten, meaning "spring season", as its Dutch language cognate lente (Old Dutch lentin) still does today. A dated term in German, Lenz (Old High German lenzo), is also related. According to the Oxford English Dictionary, 'the shorter form (? Old Germanic type *laŋgito- , *laŋgiton-) seems to be a derivative of *laŋgo- long ... and may possibly have reference to the lengthening of the days as characterizing the season of spring'. The origin of the -en element is less clear: it may simply be a suffix, or lencten may originally have been a compound of *laŋgo- 'long' and an otherwise little-attested word *-tino, meaning 'day'. In languages spoken where Christianity was earlier established, such as Greek and Latin, the term signifies the period dating from the 40th day before Easter. In modern Greek the term is Σαρακοστή (Sarakostí), derived from the earlier Τεσσαρακοστή (Tessarakostí), meaning "fortieth". The corresponding word in Latin, quadragesima ("fortieth"), is the origin of the term used in Latin-derived languages and in some others: for example, Croatian korizma, French carême, Irish carghas, Italian quaresima, Portuguese quaresma, Albanian kreshma, Romanian păresimi, Spanish cuaresma, Basque garizuma, Galician coresma, and Welsh c(a)rawys. In other languages, the name used refers to the activity associated with the season. Thus it is called "fasting period" in Czech (postní doba), German (Fastenzeit), and Norwegian (fasten/fastetid), and it is called "great fast" in Polish (wielki post) and Russian (великий пост – veliki post). The terms used in Filipino are kuwaresma (from the Spanish) and Mahál na Araw ("precious/great days"); the latter term is also used specifically for Holy Week. Various Christian denominations calculate the 40 days of Lent differently. The way they observe Lent also differs. In the Roman Rite since 1970, Lent starts on Ash Wednesday and finishes on Holy Thursday Evening (Before the Evening Mass of the Lord's Supper). This comprises a period of 44 days. The Lenten fast excludes Sundays and continues through Good Friday and Holy Saturday, totaling 40 days. In the Ambrosian Rite, Lent begins on the Sunday that follows what is celebrated as Ash Wednesday in the rest of the Latin Catholic Church, and ends as in the Roman Rite, thus being of 40 days, counting the Sundays but not Holy Thursday. The day for beginning the Lenten fast is the following Monday, the first weekday in Lent. The special Ash Wednesday fast is transferred to the first Friday of the Ambrosian Lent. Until this rite was revised by Saint Charles Borromeo the liturgy of the First Sunday of Lent was festive, celebrated in white vestments with chanting of the Gloria in Excelsis and Alleluia, in line with the recommendation in Matthew 6:16, "When you fast, do not look gloomy". The period of Lent observed in the Eastern Catholic Churches corresponds to that in other churches of Eastern Christianity that have similar traditions. In Protestant and Western Orthodox Churches, the season of Lent lasts from Ash Wednesday to the evening of Holy Saturday. 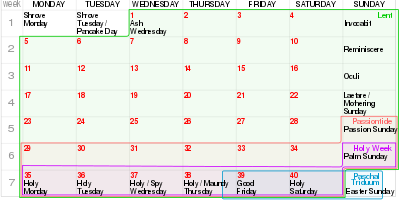 This calculation makes Lent last 46 days if the 6 Sundays are included, but only 40 days if they are excluded. This definition is still that of the Anglican Church, Lutheran Church, Methodist Church, and Western Rite Orthodox Church. 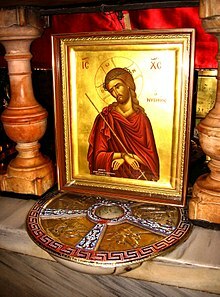 In the Byzantine Rite, i.e., the Eastern Orthodox Great Lent (Greek: Μεγάλη Τεσσαρακοστή or Μεγάλη Νηστεία, meaning "Great 40 Days" and "Great Fast" respectively) is the most important fasting season in the church year. The 40 days of Great Lent includes Sundays, and begins on Clean Monday and are immediately followed by what are considered distinct periods of fasting, Lazarus Saturday and Palm Sunday, which in turn are followed straightway by Holy Week. Great Lent is broken only after the Paschal (Easter) Divine Liturgy. The Eastern Orthodox Church maintains the traditional Church's teaching on fasting. The rules for lenten fasting are the monastic rules. Fasting in the Orthodox Church is more than simply abstaining from certain foods. During the Great Lent Orthodox Faithful intensify their prayers and spiritual exercises, go to church services more often, study the Scriptures and the works of the Church Fathers in depth, limit their entertainment and spendings and focus on charity and good works. Among the Oriental Orthodox, there are various local traditions regarding Lent. Those using the Alexandrian Rite, i.e., the Coptic Orthodox, Coptic Catholic, Ethiopian Orthodox, Ethiopian Catholic, Eritrean Orthodox, and Eritrean Catholic Churches, observe eight weeks of Lent. In Ethiopian Orthodoxy, fasting (tsome) lasts for 55 continuous days before Easter (Fasika), although the fast is divided into three separate periods: Tsome Hirkal, eight days commemorating an early Christian figure; Tsome Arba, 40 days of Lent; and Tsome Himamat, seven days commemorating Holy Week. Fasting involves abstention from animal products (meat, dairy, and eggs), and refraining from eating or drinking before 3:00 pm. Ethiopian devotees may also abstain from sexual activity and the consumption of alcohol. As in the Eastern Orthodox Churches, the date of Easter is reckoned according to the Julian Calendar, and usually occurs later than Easter according to Gregorian Calendar used by Catholic and Protestant Churches. The season of Lent begins on Ash Wednesday, most notably by the public imposition of ashes. In this photograph, a woman receives a cross of ashes on Ash Wednesday outside an Anglican church. A Lutheran pastor distributes ashes during the Divine Service on Ash Wednesday. Jonah's prophecy of judgment gave 40 days to the city of Nineveh in which to repent or be destroyed (Jonah 3:4). Jesus retreated into the wilderness, where He fasted for 40 days, and was tempted by the devil (Matthew 4:1–2, Mark 1:12–13, Luke 4:1–2). He overcame all three of Satan's temptations by citing scripture to the devil, at which point the devil left him, angels ministered to Jesus, and He began His ministry. Jesus further said that His disciples should fast "when the bridegroom shall be taken from them" (Matthew 9:15), a reference to his Passion. It is the traditional belief that Jesus lay for 40 hours in the tomb, which led to the 40 hours of total fasting that preceded the Easter celebration in the early Church (the biblical reference to 'three days in the tomb' is understood by them as spanning three days, from Friday afternoon to early Sunday morning, rather than three 24-hour periods of time). Some Christian denominations, such as The Way International and Logos Apostolic Church of God, as well as Anglican scholar E. W. Bullinger in The Companion Bible, believe Christ was in the grave for a total of 72 hours, reflecting the type of Jonah in the belly of the whale. One of the most important ceremonies at Easter is the baptism of the initiates on Easter Eve. The fast was initially undertaken by the catechumens to prepare them for the reception of this sacrament. Later, the period of fasting from Good Friday until Easter Day was extended to six days, to correspond with the six weeks of training necessary to give the final instruction to those converts who were to be baptized. Converts to Christianity followed a strict catechumenate or period of instruction and discipline prior to receiving the sacrament of baptism, sometimes lasting up to three years. In Jerusalem near the close of the fourth century, classes were held throughout Lent for three hours each day. With the legalization of Christianity (by the Edict of Milan) and its later imposition as the state religion of the Roman Empire, its character was endangered by the great influx of new members. In response, the Lenten fast and practices of self-renunciation were required annually of all Christians, both to show solidarity with the catechumens, and for their own spiritual benefit. There are traditionally 40 days in Lent; these are marked by fasting, both from foods and festivities, and by other acts of penance. The three traditional practices to be taken up with renewed vigour during Lent are prayer (justice towards God), fasting (justice towards self), and almsgiving (justice towards neighbours). However, in modern times, observers give up partaking in vices and often invest the time or money saved in charitable purposes or organizations. In addition, some believers add a regular spiritual discipline, to bring them closer to God, such as reading a Lenten daily devotional. Another practice commonly added is the singing of the Stabat Mater hymn in designated groups. Among Filipino Catholics, the recitation of Jesus Christ' passion, called Pasiong Mahal, is also observed. In some Christian countries, grand religious processions and cultural customs are observed, and the faithful attempt to visit seven churches during Holy Week in honor of Jesus Christ heading to Mount Calvary. In many liturgical Christian denominations, Good Friday, Holy Saturday, and Easter Sunday form the Easter Triduum. Lent is a season of grief that necessarily ends with a great celebration of Easter. Thus, it is known in Eastern Orthodox circles as the season of "Bright Sadness". It is a season of sorrowful reflection which is punctuated by breaks in the fast on Sundays. The Gloria in excelsis Deo, which is usually said or sung on Sundays at Mass (or Communion) of the Roman and Anglican rites, is omitted on the Sundays of Lent, but continues in use on solemnities and feasts and on special celebrations of a more solemn kind. Some mass compositions were written especially for Lent, such as Michael Haydn's Missa tempore Quadragesimae, without Gloria, in D minor, and for modest forces, only choir and organ. The Gloria is used on Maundy Thursday, to the accompaniment of bells, which then fall silent until the Gloria in excelsis of the Easter Vigil. The Lutheran Divine Service, the Roman Rite of the Catholic Church, the Anglican Churches, and the Presbyterian service of worship associate the Alleluia with joy and omit it entirely throughout Lent, not only at Mass but also in the canonical hours and outside the liturgy. The word "Alleluia" at the beginning and end of the Acclamation Before the Gospel at Mass is replaced by another phrase. Before 1970, the omission began with Septuagesima, and the whole Acclamation was omitted and was replaced by a Tract; and in the Liturgy of the Hours the word "Alleluia", normally added to the Gloria Patri at the beginning of each Hour – now simply omitted during Lent – was replaced by the phrase Laus tibi, Domine, rex aeternae gloriae (Praise to you, O Lord, king of eternal glory). Until the Ambrosian Rite was revised by Saint Charles Borromeo the liturgy of the First Sunday of Lent was festive, celebrated with chanting of the Gloria and Alleluia, in line with the recommendation in Matthew 6:16, "When you fast, do not look gloomy". In the Byzantine Rite, the Gloria (Great Doxology) continues to be used in its normal place in the Matins service, and the Alleluia appears all the more frequently, replacing "God is the Lord" at Matins. In certain pious Christian states, in which liturgical forms of Christianity predominate, religious objects were traditionally veiled for the entire 40 days of Lent. Though perhaps uncommon in the United States of America, this pious practice is consistently observed in Goa, Malta, Peru, the Philippines (the latter only for the entire duration of Holy Week, with the exception of processional images), and in the Spanish cities: Barcelona, Málaga, and Seville. In Ireland, before Vatican II, when impoverished rural Catholic convents and parishes could not afford purple fabrics, they resorted to either removing the statues altogether or, if too heavy or bothersome, turned the statues to face the wall. As is popular custom, the 14 Stations of the Cross plaques on the walls are not veiled. Crosses were often adorned with jewels and gemstones, the form referred to as Crux Gemmata. To keep the faithful from adoring the crucifixes elaborated with ornamentation, veiling it in royal purple fabrics came into place. The violet colour later evolved as a color of penance and mourning. Further liturgical changes in modernity reduced such observances to the last week of Passiontide. In parishes that could afford only small quantities of violet fabrics, only the heads of the statues were veiled. If no violet fabrics could be afforded at all, then the religious statues and images were turned around facing the wall. Flowers were always removed as a sign of solemn mourning. In the pre-1992 Methodist liturgy and pre-1970 forms of the Roman Rite, the last two weeks of Lent are known as Passiontide, a period beginning on the Fifth Sunday in Lent, which in the 1962 edition of the Roman Missal is called the First Sunday in Passiontide and in earlier editions Passion Sunday. All statues (and in England paintings as well) in the church were traditionally veiled in violet. This was seen as in keeping with the Gospel of that Sunday (John 8:46–59), in which Jesus "hid himself" from the people. Within many churches in the United States of America, after the Second Vatican Council, the need to veil statues or crosses became increasingly irrelevant and was deemed unnecessary by some diocesan bishops. As a result, the veils were removed at the singing of the Gloria in Excelsis Deo during the Easter Vigil. In 1970, the name "Passiontide" was dropped, although the last two weeks are markedly different from the rest of the season, and continuance of the tradition of veiling images is left to the discretion of a country's conference of bishops or even to individual parishes as pastors may wish. On Good Friday, the Anglican, Lutheran, and Methodist churches traditionally veiled "all pictures, statutes, and the cross are covered in mourning black", while "the chancel and altar coverings are replaced with black, and altar candles are extinguished". The fabrics are then "replaced with white on sunrise on Easter Sunday". The carnival celebrations which in many cultures traditionally precede Lent are seen as a last opportunity for excess before Lent begins. Some of the most famous are the Carnival of Barranquilla, the Carnival of Santa Cruz de Tenerife, the Carnival of Venice, Cologne Carnival, the New Orleans Mardi Gras, the Rio de Janeiro carnival, and the Trinidad and Tobago Carnival. The day immediately preceding Lent is variously called Mardi Gras ("Fat Tuesday"), Pancake Tuesday, or Shrove Tuesday. Sometimes, it is the peak of the pre-Lenten festival, while sometimes it is largely occupied with preparations for Lent. The observances vary from culture to culture, and even from town to town. Originally, in Lebanon and Syria, the last Thursday preceding Lent was called "Khamis el zakara". For Catholics, it was meant to be a day of remembrance of the dead ones. However, zakara (which means "remembrance", in Arabic) was gradually replaced by sakara (meaning "getting drunk" in Arabic), and so the occasion came to be known as Khamis el sakara, wherein celebrants indulge themselves with alcoholic beverages. Fasting during Lent was more prominent in ancient times than today. Socrates Scholasticus reports that in some places, all animal products were strictly forbidden, while various others permitted fish, or fish and fowl, others prohibited fruit and eggs, and still others permitted only bread. In many places, the observant abstained from food for a whole day until the evening, and at sunset, Western Christians traditionally broke the Lenten fast, which was often known as the Black Fast. In India and Pakistan, many Christians continue this practice of fasting until sunset on Ash Wednesday and Good Friday, with some fasting in this manner throughout the whole season of Lent. For Catholics before 1966, the theoretical obligation of the penitential fast throughout Lent except on Sundays was to take only one full meal a day. In addition, a smaller meal, called a collation, was allowed in the evening, and a cup of some beverage, accompanied by a little bread, in the morning. In practice, this obligation, which was a matter of custom rather than of written law, was not observed strictly. The 1917 Code of Canon Law allowed the full meal on a fasting day to be taken at any hour and to be supplemented by two collations, with the quantity and the quality of the food to be determined by local custom. Abstinence from meat was to be observed on Ash Wednesday and on Fridays and Saturdays in Lent. The Lenten fast ended on Holy Saturday at noon. Only those aged 21 to 59 were obliged to fast. As with all ecclesiastical laws, particular difficulties, such as strenuous work or illness, excused one from observance, and a dispensation from the law could be granted by a bishop or parish priest. A rule of thumb is that the two collations should not add up to the equivalent of another full meal. Rather portions were to be: "sufficient to sustain strength, but not sufficient to satisfy hunger". In 1966, Pope Paul VI reduced the obligatory fasting days to Ash Wednesday and Good Friday, abstinence days to Fridays and Ash Wednesday, and allowed episcopal conferences to replace abstinence and fasting with other forms of penitence such charity and piety, as declared and established in his apostolic constitution Paenitemini. This was done so that those in countries where the standard of living is lower can replace fasting with prayer, but "...where economic well-being is greater, so much more will the witness of asceticism have to be given..." This was made part of the 1983 Code of Canon Law, which made obligatory fasting for those aged between 18 and 59, and abstinence for those aged 14 and upward. The Irish Catholic Bishops' Conference decided to allow other forms of Friday penance to replace that of abstinence from meat, whether in Lent or outside Lent, suggesting alternatives such as abstaining from some other food, or from alcohol or smoking; making a special effort at participating in family prayer or in Mass; making the Stations of the Cross; or helping the poor, sick, old, or lonely. The Catholic Bishops' Conference of England and Wales made a similar ruling in 1985 but decided in 2011 to restore the traditional year-round Friday abstinence from meat. The United States Conference of Catholic Bishops has maintained the rule of abstention from meat on Friday only during Lent. Fast on Ash Wednesday and Good Friday with only one simple meal during the day, usually without meat. Refrain from eating meat (bloody foods) on all Fridays in Lent, substituting fish for example. Eliminate a food or food group for the entire season. Especially consider saving rich and fatty foods for Easter. Consider not eating before receiving Communion in Lent. Abstain from or limit a favorite activity (television, movies, etc.) for the entire season, and spend more time in prayer, Bible study, and reading devotional material. Good Friday, which is towards the end of the Lenten season, is traditionally an important day of communal fasting for adherents of the Reformed faith. During the early Middle Ages, eggs, dairy products, and meat were generally forbidden. In favour of the traditional practice, observed both in East and West, Thomas Aquinas argued that "they afford greater pleasure as food [than fish], and greater nourishment to the human body, so that from their consumption there results a greater surplus available for seminal matter, which when abundant becomes a great incentive to lust." Aquinas also authorized the consumption of candy during Lent, because "sugared spices" (such as comfits) were, in his opinion, digestive aids on par with medicine rather than food. Jousting against Carnival is represented by a fat man on a beer barrel who wears a huge meat pie as headdress; Lent is represented by a thin gaunt woman on a cart (shown here) bearing Lenten fare: mussels, pretzels, and waffles. Oil painting The Fight Between Carnival and Lent by Pieter Bruegel the Elder (circa 1558–1559). In Spain, the bull of the Holy Crusade (renewed periodically after 1492) allowed the consumption of dairy products and eggs during Lent in exchange for a contribution to the cause of the crusade. Giraldus Cambrensis, in his Itinerary of Archbishop Baldwin through Wales, reports that "in Germany and the arctic regions", "great and religious persons" eat the tail of beavers as "fish" because of its superficial resemblance to "both the taste and colour of fish". The animal was very abundant in Wales at the time. In current Western societies the practice is considerably relaxed, though in the Eastern Orthodox, Oriental Orthodox, and Eastern Catholic Churches, abstinence from all animal products including eggs, fish, fowl, and milk sourced from animals (e.g., cows and goats, as opposed to the milk of coconuts and soy beans) is still commonly practiced, so that, where this is observed, only vegetarian (or vegan) meals are consumed for the whole of Lent, 45 days in the Byzantine Rite. In the tradition of the Western Catholic Church, abstinence from eating some form of food (generally meat, but not dairy or fish products) is distinguished from fasting. In principle, abstinence is to be observed on Ash Wednesday and on every Friday of the year that is not a solemnity (a liturgical feast day of the highest rank); but in each country the episcopal conference can determine the form it is to take, perhaps replacing abstinence with other forms of penance. Even during Lent, the rule about solemnities holds, so that the obligation of Friday abstinence does not apply on 19 and 25 March when, as usually happens, the solemnities of Saint Joseph and the Annunciation are celebrated on those dates. The same applies to Saint Patrick's Day, which is a solemnity in the whole of Ireland as well as in dioceses that have Saint Patrick as principal patron saint. In some other places, too, where there are strong Irish traditions within the Catholic community, a dispensation is granted for that day. In Hong Kong, where Ash Wednesday often coincides with Chinese New Year celebrations, a dispensation is then granted from the laws of fast and abstinence, and the faithful are exhorted to use some other form of penance. After the Protestant Reformation, in the Lutheran Church, "Church orders of the 16th century retained the observation of the Lenten fast, and Lutherans have observed this season with a serene, earnest attitude." In the Anglican Churches, the Traditional Saint Augustine's Prayer Book: A Book of Devotion for Members of the Anglican Communion, a companion to the Book of Common Prayer, states that fasting is "usually meaning not more than a light breakfast, one full meal, and one half meal, on the forty days of Lent". It further states that "the major Fast Days of Ash Wednesday and Good Friday, as the American Prayer-Book indicates, are stricter in obligation, though not in observance, than the other Fast Days, and therefore should not be neglected except in cases of serious illness or other necessity of an absolute character." Traditionally, on Sunday, and during the hours before sunrise and after sunset, some Churches, such as Episcopalians, allow "breaks" in their Lent promises. For Roman Catholics, the Lenten penitential season ends after the Easter Vigil Mass. Orthodox Christians also break their fast after the Paschal Vigil, a service which starts around 11:00 pm on Holy Saturday, and which includes the Paschal celebration of the Divine Liturgy of St. John Chrysostom. At the end of the service, the priest blesses cheese, eggs, flesh meats, and other items that the faithful have been abstaining from for the duration of Great Lent. Lenten traditions and liturgical practices are less common, less binding, and sometimes non-existent among some liberal and progressive Christians. A greater emphasis on anticipation of Easter Sunday is often encouraged more than the penitence of Lent or Holy Week. Some Christians as well as secular groups also interpret the Lenten fast in a positive tone, not as renunciation but as contributing to causes such as environmental stewardship and improvement of health. Even some atheists find value in the Christian tradition and observe Lent. During Lent, BBC's Radio Four normally broadcasts a series of programmes called the Lent Talks. These 15-minute programmes are normally broadcast on a Wednesday and have featured various speakers, such as John Lennox. Ash Wednesday is the first day of Lent in Western Christianity, such as the Lutheran Churches, Roman Rite of the Catholic Church, Methodist Churches, Reformed traditions, etc. In the Ambrosian Rite and the Mozarabic Rite, there is no Ash Wednesday: Lent begins on the first Sunday and the fast begins on the first Monday. The Sundays in Lent carry Latin names in German Lutheranism, derived from the beginning of the Sunday's introit. The first is called Invocabit, the second Reminiscere, the third Oculi, the fourth Laetare, the fifth Judica, the sixth Palm Sunday. The fourth Sunday in Lent, which marks the halfway point between Ash Wednesday and Easter Sunday, is referred to as Laetare Sunday by Anglicans, Roman Catholics, and many other Christians, because of the traditional Entrance Antiphon of the Mass. Due to the more "joyful" character of the day (since laetare in Latin means "rejoice"), the priest, deacon, and subdeacon have the option of wearing vestments of a rose colour (pink) instead of violet. Additionally, the fourth Lenten Sunday, Mothering Sunday, which has become known as Mother's Day in the United Kingdom and an occasion for honouring mothers of children, has its origin in a 16th-century celebration of the Mother Church. The fifth Sunday in Lent, also known in some denominations as Passion Sunday (and in some denominations also applies to Palm Sunday) marks the beginning of Passiontide. The sixth Sunday in Lent, commonly called Palm Sunday, marks the beginning of Holy Week, the final week of Lent immediately preceding Easter. Wednesday of Holy Week, Holy Wednesday (also sometimes known as Spy Wednesday) commemorates Judas Iscariot's bargain to betray Jesus. Thursday of Holy Week is known as Maundy Thursday or Holy Thursday, and is a day Christians commemorate the Last Supper shared by Christ with his disciples. The next day is Good Friday, on which Christians remember Jesus' crucifixion, death, and burial. In the Anglican, Lutheran, Old Catholic, Roman Catholic, and many other churches, the Easter Triduum is a three-day event that begins Maundy Thursday evening, with the entrance hymn of the Mass of the Lord's Supper. After this celebration, the consecrated Hosts are taken solemnly from the altar to a place of reposition, where the faithful are invited to meditate in the presence of the consecrated Hosts.This is the Church's response to Jesus' question to the disciples sleeping in the Garden of Gethsemane, "Could you not watch with me one hour?" On the next day, the liturgical commemoration of the Passion of Jesus Christ is celebrated at 3 pm, unless a later time is chosen due to work schedules. This service consists of readings from the Scriptures, especially John the Evangelist's account of the Passion of Jesus, followed by prayers, veneration of the cross of Jesus, and a communion service at which the hosts consecrated at the evening Mass of the day before are distributed. The Easter Vigil during the night between Holy Saturday afternoon and Easter Sunday morning starts with the blessing of a fire and a special candle, and with readings from Scripture associated with baptism. Then, the Gloria in Excelsis Deo is sung, water is blessed, baptism and confirmation of adults may take place, the people are invited to renew the promises of their own baptism, and finally, Mass is celebrated in the usual way from the Preparation of the Gifts onwards. Holy Week and the season of Lent, depending on denomination and local custom, end with Easter Vigil at sundown on Holy Saturday or on the morning of Easter Sunday. It is custom for some churches to hold sunrise services which include open air celebrations in some places. In the Lutheran, Methodist, Reformed, Roman Catholic, and many Anglican churches, the pastor's vestments are violet during the season of Lent. Roman Catholic priests wear white vestments on solemnity days for St. Joseph (March 19) and the Annunciation (March 25), although these solemnities get transferred to another date if they fall on a Sunday in Lent or at any time during Holy Week. On the fourth Sunday in Lent, rose-coloured (pink) vestments may be worn in lieu of violet. Historically, black had also been used: Pope Innocent III declared black to be the proper color for Lent, though Durandus of Saint-Pourçain claims violet has preference over black. In some Anglican churches, a type of unbleached linen or muslin known as "Lenten array" is worn during the first three weeks of Lent, crimson is worn during Passiontide, and on holy days, the colour proper to the day is worn. 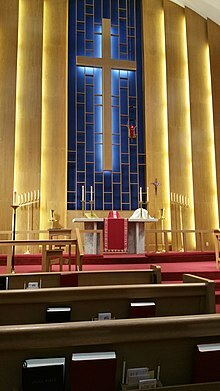 In certain other Anglican churches, as an alternative to violet for all of Lent except Holy Week and red beginning on Palm Sunday through Holy Saturday, Lenten array, typically made of sackcloth such as burlap and trimmed with crimson cloth, often velvet, is worn, even during Holy Week—since the sackcloth represents penance and the crimson edges represent the Passion of Christ. Even the veils that cover the altar crosses or crucifixes and statuary (if any) are made of the same sackcloth with the crimson trim. ^ Comparative Religion For Dummies. For Dummies. 31 January 2011. ISBN 9781118052273. Retrieved 8 March 2011. This is the day Lent begins. Christians go to church to pray and have a cross drawn in ashes on their foreheads. The ashes drawn on ancient tradition represent repentance before God. The holiday is part of Roman Catholic, Lutheran, Methodist, and Episcopalian liturgies, among others. ^ a b Gassmann, Günther (4 January 2001). Historical Dictionary of Lutheranism. Scarecrow Press, Inc. p. 180. ISBN 978-0810866201. ^ Benedict, Philip (3 March 2014). Christ's Churches Purely Reformed: A Social History of Calvinism. Yale University Press. p. 506. ISBN 978-0300105070. ^ Mennonite Stew – A Glossary: Lent. Third Way Café. Retrieved 24 February 2012. Traditionally, Lent was not observed by the Mennonite church, and only recently have more modern Mennonite churches started to focus on the six-week season preceding Easter. ^ Brumley, Jeff. "Lent not just for Catholics, but also for some Baptists and other evangelicals". The Florida Times Union. Retrieved 3 March 2014. ^ Burnett, Margaret (5 March 2017). "Students observe Lent on campus – The Brown and White". The Brown and White. Retrieved 14 March 2017. ^ a b Chisholm, Hugh (1911). The Encyclopaedia Britannica: A Dictionary of Arts, Sciences, Literature and General Information. Encyclopaedia Britannica. p. 428. The Lenten fast was retained at the Reformation in some of the reformed Churches, and is still observed in the Anglican and Lutheran communions. ^ a b c Gassmann, Günther; Oldenburg, Mark W. (10 October 2011). Historical Dictionary of Lutheranism. Scarecrow Press. p. 229. ISBN 9780810874824. In many Lutheran churches, the Sundays during the Lenten season are called by the first word of their respective Latin Introitus (with the exception of Palm/Passion Sunday): Invocavit, Reminiscere, Oculi, Laetare, and Judica. Many Lutheran church orders of the 16th century retained the observation of the Lenten fast, and Lutherans have observed this season with a serene, earnest attitude. Special days of eucharistic communion were set aside on Maundy Thursday and Good Friday. ^ Hines-Brigger, Susan. "Lent: More Than Just Giving Up Something". Franciscan Media. Retrieved 17 March 2019. ^ a b Crumm, David. Our Lent, 2nd Edition. ISBN 978-1934879504. ^ Ambrose, Gill; Craig-Wild, Peter; Craven, Diane; Moger, Peter (5 March 2007). Together for a Season. Church House Publishing. p. 34. ISBN 9780715140635. ^ a b c Weitzel, Thomas L. (1978). "A Handbook for the Discipline of Lent" (PDF). Evangelical Lutheran Church in America. Retrieved 17 March 2018. ^ a b Gavitt, Loren Nichols (1991). Traditional Saint Augustine's Prayer Book: A Book of Devotion for Members of the Anglican Communion. Holy Cross Publications. ^ This practice is observed in numerous pious Christian countries, although the form of abstention may vary depending on what is customary. Some abstain from meat for 40 days, some do so only on Fridays, or some only on Good Friday itself. By pontifical decree under Pope Alexander VI, eggs and dairy products may be consumed by penitents in Spain and its colonized territories. ^ "What is Lent and why does it last forty days?". The United Methodist Church. Retrieved 24 August 2007. ^ "The Liturgical Year". The Anglican Catholic Church. Retrieved 24 August 2007. ^ "When does Lent really end? | Catholic Answers". www.catholic.com. Retrieved 6 July 2018. ^ a b Langford, Andy (4 January 1993). Blueprints for worship: a user's guide for United Methodist congregations. Abingdon Press. p. 96. ^ a b Akin, James. "All About Lent". EWTN. Retrieved 3 March 2014. ^ Knowlton, MaryLee (2004). Macedonia. Marshall Cavendish. p. 125. ISBN 9780761418542. Traditionally, as in many Christian countries, the carnival marked the beginning of Lent, which ushered in a six-week period of fasting for Christians. ^ "lente (voorjaar)". etymologiebank.nl. Archived from the original on 4 February 2016. Retrieved 28 January 2016. Chisholm, Hugh, ed. (1911). "Lent" . Encyclopædia Britannica. 16 (11th ed.). Cambridge University Press. p. 427. ^ Philippart, David. "If Lent is 40 days, why are there 46 days between Ash Wednesday and Easter?". U.S. Catholic. The Claretians. Retrieved 3 March 2019. ^ a b "Il Tempo di Quaresima nel rito Ambrosiano" (PDF) (in Italian). Parrocchia S. Giovanna Antida Thouret. Retrieved 9 June 2014. ^ The Roman and the Lutheran Observance of Lent. Luther League of America. 1920. p. 5. ^ What is Lent and why does it last forty days?. The United Methodist Church. Retrieved 20 April 2014. Lent is a season of forty days, not counting Sundays, which begins on Ash Wednesday and ends on Holy Saturday. Sundays in Lent are not counted in the forty days because each Sunday represents a "mini-Easter" and the reverent spirit of Lent is tempered with joyful anticipation of the Resurrection. ^ Kitch, Anne E. (10 January 2003). The Anglican Family Prayer Book. Church Publishing, Inc. p. 130. ^ The Northwestern Lutheran, Volumes 60–61. Northwestern Publishing House. 1973. p. 66. ^ Fenton, John. "The Holy Season of Lent in the Western Tradition". Western Rite of the Antiochian Orthodox Christian Archdiocese of North America. Retrieved 3 March 2014. ^ "Fasting and Great Lent – Antiochian Orthodox Christian Archdiocese". Antiochian.org. Retrieved 21 November 2017. ^ a b c James Jeffrey (22 March 2017). "Ethiopia: fasting for 55 days". Deutsche Welle. Retrieved 24 March 2017. ^ "Tsome Nenewe (The Fast of Nineveh)". Minneapolis: Debre Selam Medhanealem Ethiopian Orthodox Tewahedo Church. 28 January 2015. Archived from the original on 5 April 2015. Retrieved 30 March 2017. ^ Burke, Daniel (13 April 2011). "Just How Long Did Jesus Stay in the Tomb?". www.huffingtonpost.com. Retrieved 23 March 2015. ^ Hinson, E. Glenn (1 January 1981). The Evangelization of the Roman Empire: Identity and Adaptability. Mercer University Press. ISBN 9780865540149. Like its parent, Judaism, earliest Christianity had a catechism for its converts, as much recent study has proven. ... Hippolytus required up to three years' instruction before baptism, shortened by a candidate's progress in developing Christian character. ^ "General Norms for the Liturgical Year and the Calendar, 19". Catholicliturgy.com. Retrieved 27 August 2010. ^ "Why don't we use alleluias during Lent?" (PDF). Evangelical Lutheran Church in America. 2013. Retrieved 22 March 2018. ^ Weaver, J. Dudley, Jr. (2002). Presbyterian Worship: A Guide for Clergy. Geneva Press. p. 106. ISBN 9780664502188. The alleluia is traditionally not sung during Lent, and, here at the first service of Easter, it is at last reintroduced to the church's liturgy. ^ Bratcher, Dennis (2015). "The Days of Holy Week". CRI. ^ Guéranger, Prosper; Fromage, Lucien (1912). The Liturgical Year: Lent. Burns, Oates & Washbourne. p. 8. Retrieved 7 February 2019. St. Benedict's rule prescribed a great many fasts, over and above the ecclesiastical fast of Lent; but it made this great distinction between the two: that whilst Lent obliged the monks, as well as the rest of the faithful, to abstain from food till sunset, these monastic fasts allowed the repast to be taken at the hour of None. O'Neill, James David (1909). "Fast" . In Herbermann, Charles (ed.). Catholic Encyclopedia. 5. New York: Robert Appleton Company. ^ "CIC 1917: text – IntraText CT". Intratext.com. Retrieved 21 November 2017. ^ Gregson, David. "Fasting". EWTN. Eternal Word Television Network. Retrieved 9 February 2015. ^ "Paenitemini (February 17, 1966) – Paul VI". w2.vatican.va. Retrieved 21 November 2017. ^ a b "Code of Canon Law – IntraText". Vatican.va. Retrieved 21 November 2017. ^ "Friday Penance resource from ICBC". Catholicbishops.ie. Retrieved 21 November 2017. ^ "Fasting and Abstinence. Statement from the Bishops of England and Wales on Canons 1249–1253" (PDF). ^ "Catholics asked to abstain from meat for Friday penance". BBC News. 16 September 2011. ^ "EWTN Q & A, Response". Ewtn.com. Retrieved 21 November 2017. ^ a b Ripley, George; Dana, Charles Anderson (1883). The American Cyclopaedia: A Popular Dictionary for General Knowledge. D. Appleton and Company. p. 101. The Protestant Episcopal, Lutheran, and Reformed churches, as well as many Methodists, observe the day by fasting and special services. ^ Richardson, Tim H. (2002). Sweets: A History of Candy. Bloomsbury USA. pp. 147–148. ISBN 978-1-58234-229-0. ^ Alejandro Torres Gutiérrez, Universidad Complutense de Madrid. "Millennium:Fear and Religion". Archived from the original on 18 August 2002. ^ "Baldwin's Itinerary Through Wales No. 2 by Giraldus Cambrensis". Gutenberg.org. 31 December 2001. Retrieved 27 August 2010. ^ "Catholics United for the Faith – Lent – Discipline and History – Teaching the Catholic Faith". Catholics United for the Faith – Catholics United for the Faith is an international lay apostolate founded to help the faithful learn what the Catholic Church teaches. ^ Colin B. Donovan, Fast and Abstinence. Retrieved 28 December 2007. ^ Engber, Daniel (15 March 2006). "Thou Shalt Eat Corned Beef on Friday: Who Sets the Rules on Lent?". Slate. Retrieved 13 February 2010. ^ "Penitential Days – Catholic Diocese of Hong Kong". ^ "The Church's Discipline as to Fasting and Abstinence". Anglican Communion. Retrieved 3 March 2014. ^ "Ash Wednesday: What Is Ash Wednesday? How Do We Observe It? Why Should We?". Patheos.com. Retrieved 25 March 2014. ^ "An Ecofeminist Perspective on Ash Wednesday and Lent". USA: Peter Lang Verlagsgruppe. Retrieved 25 March 2014. ^ Hebden, Keith (3 March 2014). "This Lent I will eat no food, to highlight the hunger all around us". The Guardian. ^ DiLallo, Matt (2 March 2014). "Believe it or Not, Catholics Observing Lent Save Our Environment". Fool.com. Retrieved 25 March 2014. ^ Kellow, Juliette (4 March 2014). "Cut out one treat for Lent and your waistline could reap the benefits". Daily Express. Retrieved 25 March 2014. ^ Winston, Kimberly (18 March 2013). "After giving up religion, atheists try giving up something else for Lent". Religion News Service. Retrieved 19 March 2013. ^ "Programmes: Lent Talks". BBC. ^ Lennox, John (27 March 2012). "John Lennox's Lent Talk for Radio 4". RZIM. Archived from the original on 14 March 2016. Retrieved 22 March 2018. ^ "spy, n.", OED Online, Oxford University Press, December 2013, Spy Wednesday n. in Irish use, the Wednesday before Easter. ^ Packer, George Nichols (1893). "Our Calendar: The Julian Calendar and Its Errors, how Corrected by the Gregorian". Corning, NY: [The author]. p. 112. Retrieved 15 December 2013. Spy Wednesday, so called in allusion to the betrayal of Christ by Judas, or the day on which he made the bargain to deliver Him into the hands of His enemies for 30 pieces of silver. ^ Gally, Howard E. (25 January 1989). Ceremonies of the Eucharist. Cowley Publications. p. 45. ISBN 9781461660521. In recent decades there has been a revival of the ancient use of red (crimson or scarlet) for Holy Week among both Episcopalians and Lutherans. The Roman rite has restored the use of red only on Palm Sunday and Good Friday. ^ Kellner, K. A. H. (1908). Heortology: A History of the Christian Festivals from Their Origin to the Present Day Kegan Paul Trench Trubner & Co Limited. p. 430. ^ The Church of England rubric states: "The colour for a particular service should reflect the predominant theme. If the Collect, Readings, etc. on a Lesser Festival are those of the saint, then either red (for a martyr) or white is used; otherwise, the colour of the season is retained." See page 532 here. Wikimedia Commons has media related to Lent (fasting period). Look up Lent in Wiktionary, the free dictionary.